Mark Rutte has been the prime minister of the Netherlands since 2010. But why is he of interest to you, as a cyclist? The Dutch leader rides his bicycle to work. Yes, the Prime Minister loves peddling along the street without the high-profile entourage that characterizes first world leadership. But why does he do that? Netherlands is an economic powerhouse and is currently top 20 in terms of GDP. Therefore, the country can easily afford some of the best entourage in the world. Mark Rutte is among the few leaders that enjoy cycling. But we might also add that the Netherlands is one of the most bike-friendly countries in the world. It is in the top position together with Denmark, and so it might have something to do with deeply embedded culture. We might not all belong to a country like the Netherlands or Denmark that has a rich culture of cycling. However, there are many benefits associated with cycling including keeping fit and enjoying the fresh air as you ride to work. Cycling is generally one of the most fun activities. But unlike driving, you need a good quality backpack to carry the items that you are going to need for the day. The best cycling backpack can contribute to the fun of cycling to work and other places. But how do you choose the best backpack that you can use with your bicycle? There are various options of cycling backpacks on the market, and the ideal one for you depends on such factors as the items that you will be carrying. It also depends on where you will be taking the backpack to. For example, the cycling backpack should be formal and official looking, if you will be riding to the office. The following are the various options. Banjo Brothers are one brand with a good reputation when it comes to backpacks. 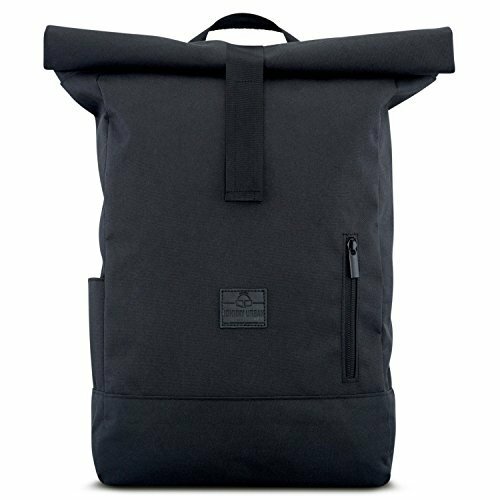 And true to their commitment to quality and durable products, this commuter backpack is without a doubt one of the best. But what is so special about it? 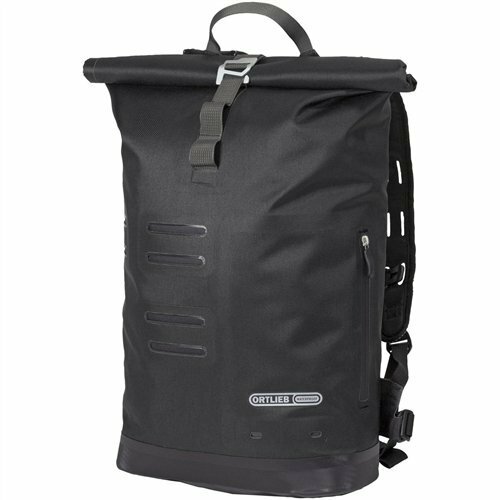 The best cycling commuter backpack should have certain features such as a durable material and excellent waterproofing. And that is what Banjo Brothers 05009 is all about. 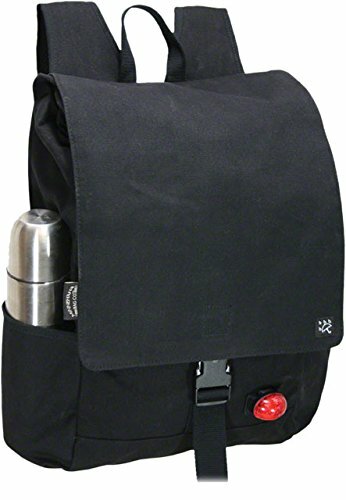 It has a heavy-duty cotton canvas that protects everything you are carrying from the elements. More importantly, the backpack has a sturdy design to ensure it lasts throughout the years. It is always a good thing to make savings by buying a quality product that lasts a long time. Even better, the interior is 100% waterproof. That means your items are free from moisture and water. For example, you can carry your laptop or iPad without worrying that the weather may change and ruin your device. You can never be too sure when it comes to weather, and so a waterproof backpack is always perfect for cyclists. The dry wax finish is responsible for giving the bag its waterproofing capability. A backpack should not be too big to carry especially if you’re a cyclist. An extra-large bag can negatively affect aerodynamics and your efficiency when cycling. Banjo Brothers 05009 is just the right size for you. Its capacity of 1500 cubic inches is sufficient to carry a change of clothes, a laptop, shoes, and lunch. Typically, you will have everything you need for your travel. Durability, lightweight design, and simplicity are some of the qualities that set this cycling backpack above the rest. You have to admit that this backpack looks quite good, and feels comfortable at your back. Cycling is not like driving a vehicle. You need to focus on the road and maintain balance to be safe. In that context, the cycling backpack should be as comfortable as possible. Unfortunately, it is not every backpack on the market that is genuinely comfortable. 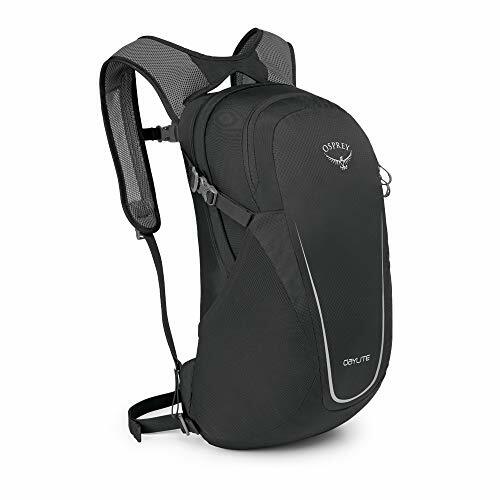 However, Osprey Packs Daylite Daypack is as comfortable as you would expect from a good quality cycling bag. The die-cut foam mesh-covered back panel is more comfortable than any other backpack that you have come across. It feels good riding across town in the heat of the day. The cycling daypack is breathable and is perfect especially when cycling for long distances where you sweat significantly. The daypack comes with an external hydration pocket that keeps you hydrated as you cycle. As a result, you can cycle for long distances without worrying about staying hydrated. Also, it can sometimes be difficult riding in hot weather, and the built-in hydration pocket makes the cycling a little comfortable. 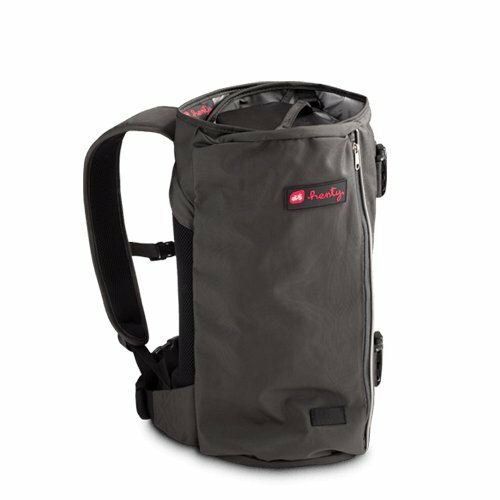 Osprey Packs Daylite Daypack makes organization easier for you. For example, it has a decent and designated laptop pocket that keeps your device safe from the rest of the stuff. The laptop compartment is a useful feature especially in contemporary times where laptops and iPad are quite standard. Mainly, these devices have become a way of life or rather a part of life. Therefore, this laptop pocket is a great addition. Lightweight pack it only weighs 1 lb. This cylindrical and compact backpack is another excellent option for fun-loving cyclists. In essence, the bag has an attractive design that any cyclist would love. Well, it may not appear official for some people, and may not be the best for the office. However, that may be a matter of personal opinion and of course, preference. Some people will not have a problem taking Henty Wingman-Compact Backpack to the office. Apart from the attractive design, the backpack is compact and lightweight. That is precisely what most cyclists prefer. Therefore, it will not weigh you down and the compact design makes it easy to carry. However, it is not too compact to carry the essentials that you need as you travel from one place to the other. For most people, 15 liters capacity is more than enough. It is adequate. Henty Wingman-Compact Backpack is weatherproof, and you can rest assured that all your items are safe within the backpack. As mentioned earlier, you can never be too careful when cycling outdoors. Weather is unpredictable, and as a cyclist, always be prepared. And the fact that the backpack is weatherproof or also makes it durable. It has a sturdy material that easily resists wear and tears to serve you for a long time. The pack has durable rubber YKK zippers that give you adequate service. You will find large external pockets that help keep your items organized even as you cycle to work. In particular, there is an external pocket that can fit up to a 15-inch laptop. There’s also another one for keys and other small items. Fifteen liters capacity to carry the essentials. The full-featured commuter bag is for the people that have a lot to carry from one place to the other. It is the all-in-one backpack bag that lets you take everything that you need on your journey. The hassle associated with the several packing bags can be time-wasting. 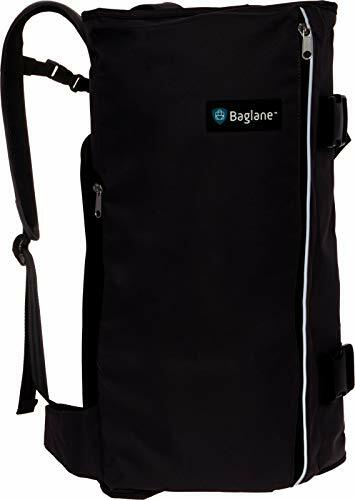 However, BagLane Hybrid Commuter Backpack Garment Bag has a functional capacity to carry several changes of clothes, your laptop, shoes and everything else that you need to cycle across the country. It is always imperative that a cycling commuter backpack is waterproof and durable. As mentioned earlier, the weather is unpredictable, and it is always good to have a bag that can prevent water from going inside. It is never much fun cycling from one place to the other and checking the skies for any signs of weather change. Fortunately, this backpack is waterproof and durable as well. You can ride comfortably and not be in a rush to reach your destination as fast as possible to avoid the changing weather. The bag also has durable construction that makes it quite sturdy to withstand constant use. The 600 Denier waterproof polyester is as strong as any traveler wants it to be. It also has industrial zippers that do not disintegrate under heavy use. This backpack makes organization easy and efficient. There are several pockets and compartments that you can use to keep everything neat and easy to find. The main problem that many cyclists encounter is this organization of items inside a backpack. Not finding the things that you need at the moment can be time-wasting and frustrating. You will see a small pocket for such items as pens and toiletries. 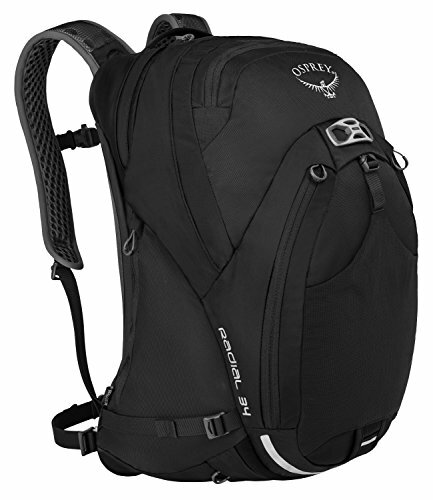 Three words describe Osprey Packs Radial 34 Daypack; streamlined, comfortable and attractive. Mostly, this day pack has almost everything to make cycling fun. Osprey Packs Radial 34 Daypack is as comfortable as they come. It has thick padded shoulder straps to avoid any stress to your shoulders and neck. Some of the comparable bags on the market have thin straps that can cause all manner of problems to your shoulders. You must admit that the backpack has an attractive design. It has the aesthetics to please anyone. Of course, if you appreciate good looking products. Several pockets and compartments make the organization a simple exercise. The main compartment has mesh pockets and document holder for your convenience. It is the kind of bag that you can take to the office, and not raise an eyebrow among the staff. The other pictures that you are going to find useful include the helmet attachment, blinker light attachment, and integrated kickstand. The helmet attachment is unique, and you will not see it with most people. In particular, the helmet attachment let your hands be free to do something else after packing the bike. For example, grabbing some lunch from the filling station is comfortable for you. The blinker light attachment enhances your visibility on the road. On the other hand, the integrated kickstand keeps the bag upright and avoids disorganizing your stuff. This is the ultimate bike commuting and travel bag. It is convenient, lightweight and easy to carry. As a cyclist, you are going to find the backpack useful and perfect for your needs. The best cycling backpack for daily commuting should be convenient and easy to carry. Cycling is not the easiest thing to do, and a significant amount of concentration, as well as, balance is necessary. You cannot afford to have anything that affects the balance in any way. What makes it the best is that it conveniently attaches to the bike rack for easy travel. Therefore, your back is free, and you can ride comfortably and effectively. It is not impossible to go for long distances with this kind of travel bag. It is one of the most convenient that you’ll come across. The TPE coated 600D polyester is waterproof and durable. For the additional cover, the backpack comes with a rain cover to further protect your items from getting wet. The polyester material is durable and reliable for daily use. The material is abrasion resistant and does not give in when exposed to strong wind and other elements of weather. The several pockets such as the phone pocket, laptop sleeve, pen holder and bottle pocket help keep your stuff organized. Therefore, it is easier to find your things from various pockets. Durable and stronger polyester material. To some people, Timbuk2 Tuck Pack may have a strange design. However, it is unique and stands out in a special way. In simpler terms, the backpack is attractive to most people. Among the highlight features associated with this backpack include the attractive design. It is a bag for commuters that want to stand out in a crowd. With a streamlined and simple look, the pack is ideal for a variety of occasions. It is the kind that you can take to the office, or even other outdoors such as a party. The streamlined design is also perfect for on bike use. Its medium weight and volume, together with the roll-up design make this bag a good fit for a variety of uses. In other words, it is versatile, and a good investment for people that prefer to have 1 product instead of many. Most of us are like this. And while the pack keeps it simple in design, it has one of the most effective pocketing. The laptop compartment is exceptional, and the others are accessible and in the right places. There are side water bottle pockets and a U lock. You can use this pocket for your umbrella. The on-bike comfort combined with the numerous pockets makes it ideal for use when cycling. Furthermore, the roll-top closer combines with the side zipper for easier access. You don’t have to waste time trying to reach your stuff inside. Visibility is a critical feature that every cycling backpack should have. Unfortunately, it is not all backpacks that claim to be cycling packs can boast this feature. Timbuk2 Tuck Pack has a reflective logo, and zipper pulls to keeping visible to other road users. Undoubtedly, the streamlined design of this daypack is quite appealing. It is comfortable, as well as, compact for his use when cycling. The material on this backpack is durable nylon. Essentially, the material is water resistant and keeps your items safe for moisture and water. In case there are some weather changes, you can be sure that your devices are secure as you rush to go to a shelter. Please note that this backpack is not waterproof. Therefore, you will need to take extra care, and not to cycle when it is raining heavily. The backpack has a large compartment where you can put the necessary items you need for the journey. There’s also a separate section for notebooks and essential documents. The separate notebook and document section provide adequate protection to your important documents. It also keeps them organized and easy to access. Also, the main compartment can fit up to 15-inch laptop comfortably. And if you have an iPad instead, then bring it along is as comfortable as possible. Will also find an exterior pocket where you can keep car keys and other small stuff that you need to access easily and quickly. With wide shoulder straps and lightweight design, the backpack is comfortable and easy to carry. Often, uncomfortable bags don’t have good shoulder straps and maybe a little heavy. It also has adequate ventilation to improve the comfort of carrying it around. You don’t have to be uncomfortable when carrying your items from one place to the other. But apart from comfort, the backpack improves your visibility on the road. Therefore, other road users can easily spot you enjoy riding on a bicycle. The removable belt straps only add to the carry comfort. The roll top design on this The Johnny Urban backpack is quite attractive. It is simple and stylish, just the way you like it for your daily commute to the office or college. With so much focus on global warming and greenhouse gases, having a product made from sustainable materials goes a long way. In a way, you play your part in making the world a better place. Johnny Urban uses sustainable materials from 100% recycled plastic water bottles. The backpack is easy to carry and comfortable as well. It has subtle padding made from durable rubber to reduce any possible discomfort from taking the bag over long distances. The rubber padding also protects your belongings when traveling for long distances. of course; there is reduced shock and friction that can get to your stuff inside the bag. It also comes with a fully padded 15.6-inch laptop pocket that protects the device from shock, and abrasion. Therefore, you can ride comfortably knowing that your laptop and iPad are safe and secure inside the bag. It is a fact that some of us cannot ride comfortably because they worry about the safety of their devices inside the bag. The 18-liter capacity is not so bad for daily commuters. It is sufficient, and you can bring the necessary items such as a laptop and a notebook. The backpack is perfect for the office and college use. You can also increase the capacity of 22 liters by unrolling the top section. This is an excellent feature if you need to carry more stuff. Finding the best cycling backpack is never a walk in the park. You see, there are numerous types of bags on the market. And it is not all of them that are appropriate for cycling. But how do you pick a cycling backpack? Do you make an educated guess? Of course not! Certain factors can guide you in the selection process. It shouldn’t be so hard as long as you know what you should be looking for. Compare it to buying a motor vehicle. You cannot buy your first car based on looks alone. Looks can be deceiving, and we are guilty of making choices by first impressions. However, other factors such as engine capacity, transmission, and upholstery come into question. Similarly, there are specific elements that will guide you to your ideal cycling backpack. The following are some of them. One of the things that can come in the way of cycling fun is the unpredictable weather. As long as you’re recycling, you are at the mercy of the elements. You should always prepare in advance for any eventualities. That means having a backpack that can keep your items dry even when the sky decides to open up when you are in the middle of your journey. Contemporary commuters have a big list of things that they need to carry from one place to the other. For example, smartphone, iPad and tablet are the modern necessities that some of us not leave the house without. They are now an essential part of our lives. Therefore, it is not uncommon to find cyclists carrying technological devices. In such a case, any wet weather can destroy the devices. Keep your eyes open for such features as a water-resistant material and good zipper. What we mean by good zipper is one that does not let in water and moisture. In the majority of cases, water-resistant backpacks can do the work of keeping your items dry. After all, you would not be riding a bicycle when it is raining heavily. The water-resistant bag can keep off the water until you find shelter. But if you want to be sure, you can go for a waterproof backpack. Usually, the choice is yours. The number of pockets and compartments will mostly depend on preference. However, you will need quick access pockets when cycling. You need quick access to such items such as smartphone, keys, and wallet. You don’t have the time to rummage through the main compartment trying to find your wallet. Quick-access pockets make it easy for you. Interior organization will also be critical as you cannot have your items getting disorganized as you move your body to peddle. It would not end well if the backpack does not have good compartments to help in the interior organization. In the absence of useful compartments and pockets to help in organizing your items, it would be almost impossible to keep everything in good condition. It is not ideal to find your cell phone inside the lunchbox. Determine the things that you will be carrying in the majority of the time. For example, a laptop compartment is vital if you’ll be taking it from time to time. You cannot afford to have your laptop together with other items such as keys find coins. Unlike other types of backpacks, the best cycling backpack should enhance your visibility on the road. For example, it should have a reflective detailing at the back to help other road users see you. Alternatively, it can have attachment points where you can put bicycle lights and improve your visibility. When you are leaning left and right, you need optimum comfort at your back to focus on the road. In that context, search features of sternum straps, padded shoulder straps, and waist belt will help stabilize the load. And if you are riding in warmer climates, a well-ventilated back will go a long way into ensuring carry comfort. Sufficient padding on the back panel is ideal especially if you will be carrying heavy loads. The bag that you choose should be appropriate for the environment you’ll be riding to. For example, you cannot be too casual if you are cycling to the office. However, some offices are liberal and having a bag in the various aesthetics will not produce unlikely sentiments and opinions. To avoid problems, either with the clients or the employer, choose the most fitting style. One of the most overlooked features when it comes to choosing bike courier backpacks is the design. You cannot use the bag that you use for hiking and camping as a cycling backpack. But why is it not so? In science, a streamlined object has better aerodynamics and does not create a lot of friction. For example, water animals such as fish have streamlined bodies to make movement easier. It can move very fast and avoid any danger that it may encounter. The same case applies to airplanes and supercars. Oh yes, the supercars! But the main question is, how do streamline and aerodynamics apply in cycling backpacks? The idea is that the bag should not be too big to block air movement and the speed at which you are traveling. It should have a design that makes movement easier for you. For example, a backpack with a slightly triangular shape towards the back and does not extend beyond your body can prove useful in terms of aerodynamics. In most cases, budget and durability go hand in hand. You cannot expect a cheap cycling backpack to last through the years. Somebody said that quality costs money. It takes various resources and research to come up with a good quality cycling backpack. Therefore, you cannot expect it to be cheaper than it costs to make it. In ideal situations, the cost of the cycling backpack should not come before its quality. But which are the perfect materials for cycling backpacks? There are various materials of cycling backpacks that you can choose from, and which are durable. Among them is nylon 1000, polyester high-density and of course high-density canvas. Some bags also have tanned leather, and they look quite good. Research shows that we are all vulnerable to first impressions and aesthetic appeal. They say that beauty is in the eye of the beholder, but we all appreciate good looking things. It, therefore, goes without saying that an aesthetically appealing backpack is better than the one that looks too ordinary. You see, you will be riding outdoors, and it is quite preferable if the cycling backpack has an appealing design. 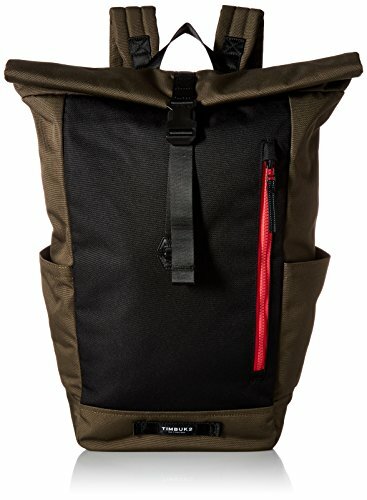 Should I go for waterproof cycling backpack? What makes us unique is that we are all different. Therefore, some of us may love cycling regardless of the weather. In other words, some people may not let rain hold them back. In such a case, a waterproof cycling backpack is the most appropriate. Typically, it will keep water and moisture away from your stuff, and that is, of course, your goal. Apart from the waterproof material, the best waterproof cycling backpack should have a waterproof zipper. It is not unusual to find that a particular bag has a weakness around the zipper. It is always the Achilles heels. Alternatively, you can opt for a bag that comes with a waterproof cover that you can always use when it starts raining. 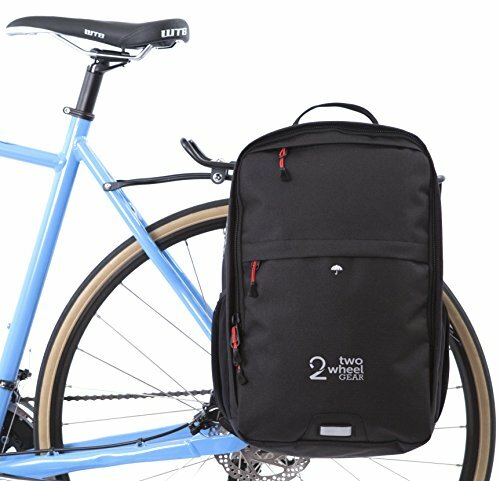 Can I find eco-friendly cycling backpack? Among the advantages of globalization and advancement in the internet, technology is that we now have more products on the market. The more products we have in the market, the better our choices. That said, there are several eco-friendly cycling backpack options that you can choose from. For example, Green Guru Joyride is from recycled materials such as street sign junk. Which are the safety features of cycling backpacks? Visibility is critical when cycling for safety. It is vital that other road users can see you well even from a distance. Unfortunately, it is not all backpacks that have these visibility features. For example, it is vital that a cycling backpack has several reflective surfaces that help other road users see you well. Other safety features can include bright colors such as orange. Unfortunately, it is not most people that like such bright colors. Hip belt and adjustable shoulder straps ensure that the load is secure on your back. You see, you will need to move sideways as you pedal, and a loose backpack can prove a safety risk. The design of the backpack is also outstanding. Ideally, a streamlined bag will improve the aerodynamics and cycling will be easy for you. The resistance is minimal with a compact and sleek pack. Which is the ideal weight of a cycling backpack? Cycling backpacks come in a variety of carrying weights. We have different things that we need to carry when commuting daily. Therefore, the ideal weight may depend on and the items that we will be carrying. However, a backpack for bike commuting should not be too heavy to affect your concentration and balance. Ideally, it should be something below 5 pounds. Cycling is one of the most efficient and fun ways to keep fit. However, it cannot be fun if you cannot bring your favorite technological devices with you. We have to admit that cell phones and other devices such as laptops have become a part of our lives. The best commuter cycling bags allow you to bring everything that you need as you commute by cycling from one place to the other. Apart from the beautiful design, the backpack has a convenient and large external pocket where you can put the items you need on quick access. The bag also comes with a 15-inch laptop pouch to bring the office with you to wherever you ride your bicycle. Work never has to stop just because you are on the move. The hip belt and padded shoulder straps make the bag even more comfortable to carry. For visibility and road safety, the backpack has reflective piping and logo. Therefore, you are visible to other road users.